Looking for an easy way to add a little spice to your space, but don't want to break the budget? Weve got you covered. 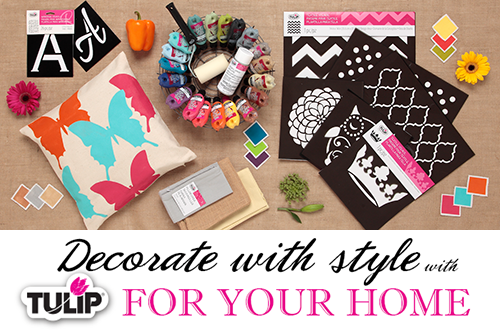 This super new & fun DIY stencil program includes stencils, Soft paints, tools, and pillow covers, which will add an instant pop of personality to your textiles and decor! 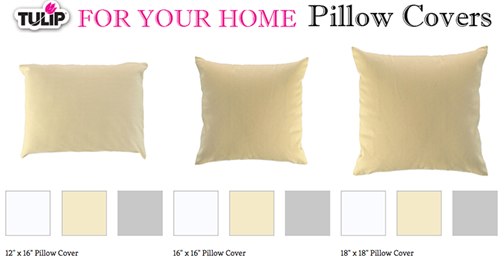 Are you ready to give a fab makeover to your pillows, lampshades, tablecloths, floor cloths? Let's get this painting party started! These products are available now at select Michaels stores, JoAnn, Hobby Lobby stores, and online at iLoveToCreate.com ! There are several fun components in this program that you are going to want to check out...first up...the 14x14 large stencils! These stencils are much bigger than the stencils you find in stores today! 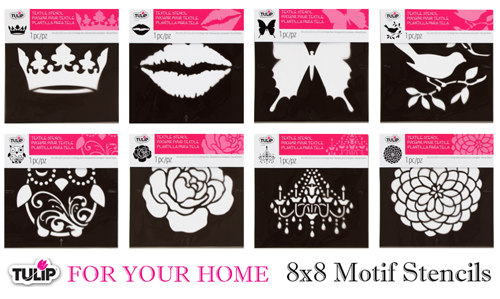 They are perfect for using on their own or layering with our motif stencils below! Also, they are transparent, so lining up to create larger patterns is as easy as pie! Find more about these stencils here. 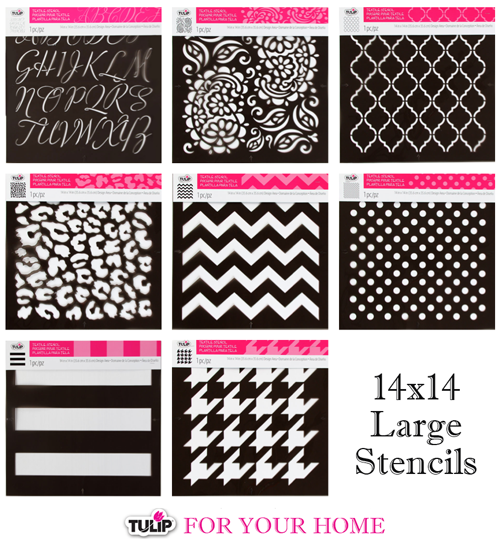 Our 8" motif stencils are great for layering over top of the 14"x14" stencils and are available in 12 trendy designs. 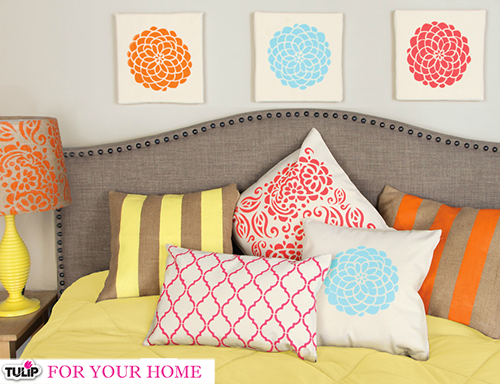 They are also perfect for creating repeating, overlapped designs as you see in the butterfly pillow above! Learn more here. Lastly, our stencil collection also includes monograms! Available in block and script type, they make personalizing a breeze! See more about this product here. Just for this line, we developed some awesome new Tulip® Soft® Fabric Paint colors, chosen to coordinate with today's popular home décor styles! Whether you are looking for muted tones, bright hues, or a neutral look, we've got you covered! See full selection here. You always need the right tools for the job, and this stencil spray adhesive and paint roller make painting your textiles an absolute breeze. This repositionable spray adhesive provides even spray coverage on stencils for a secure, temporary hold to fabrics in order to prevent shifting and seepage when applying paint. Get clean, crisp results without any yucky residue left behind! The paint roller has a comfort-hold handle and gives you minimal dripping and a smooth, even paint application. 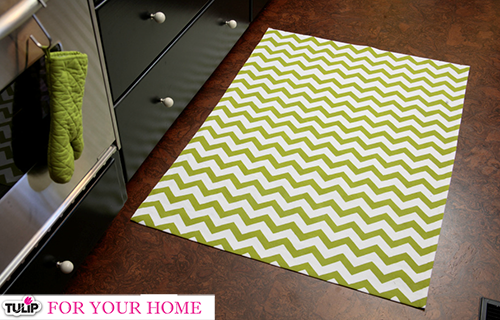 Completely washable and reusable for all your home décor projects! 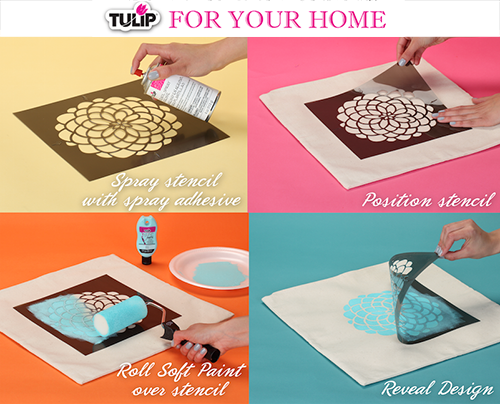 We also have 3 sizes of Tulip Pillow Covers that were created exclusively to go with our stencils and paints! Available in white, tan, and grey, there's a blank canvas for everyone to make their own unique creation! I know you are thinking..."Awesome, but how do these cool products work together! Let us show you! 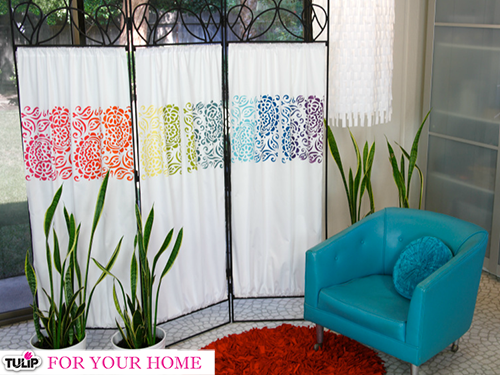 They might just be the easiest DIY décor project you've seen in a while! 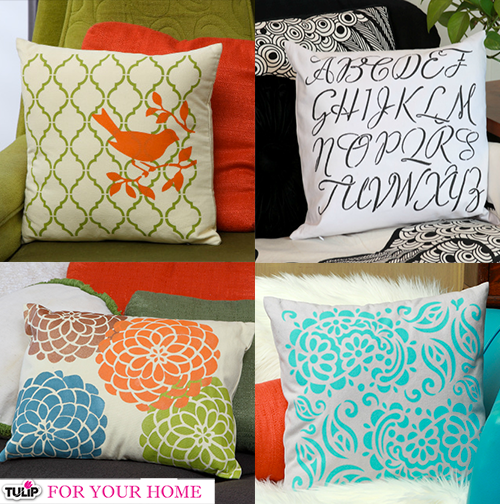 Here's just a few eye candy pieces for you to get inspired using Tulip for Your Home products! Which project is your favorite? 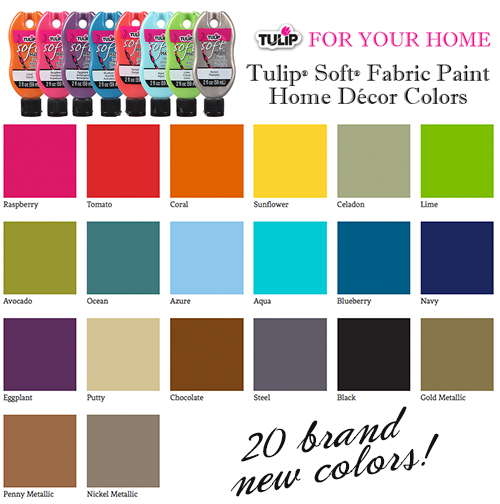 To learn even more about these awesome new Tulip products and for more tips, hints and inspiration, visit www.tuliphomedecor.com !